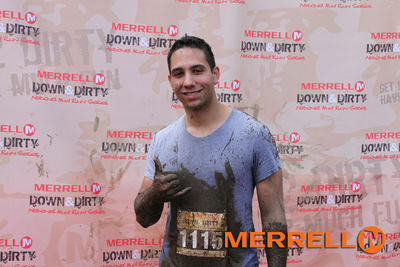 This past Sunday I completed the Merrell Down & Dirty 5K Race. This was the first "Mud Run" that I had signed up for and had no idea that I would have completed two Mud Runs before ever even getting to this one. The organizers of this event had two courses, one a 5K and the other a 10K and if I had the ability to change my choice so close to the actual run, I would have chosen the 10K. The actual course itself was awsome. I have found that I love running through trails and there was plenty of it. For the first time I was able to complete a 5K while running the entire time. My knee did bother me somewhat but I pushed through it, completeing the course in 40 minutes and 55 seconds. My best time so far. Not bad for a guy with a shoddy knee. My only complaint about the actual race was that they had only one start time. The prior mud runs (The Spartan Race and The Warrior Dash) both had races on Saturday and Sunday with waves starting at thirty minute intervals. Waves are merely a set number of people starting a certain time as to not crowd the course and create a hazard. On both those races I decided to start midway through the day at the 1 p.m. wave. However, with the Merrell Down & Dirty race, start time was 8 a.m. for everyone and they had the participants self organize into how fast they thought they could complete a mile. I chose to head toward the back in a slower category knowing I was only racing against a time and it didn't really matter it chunks of people were phycially ahead of me when starting. The clock doesn't begin to run until you cross the start line. However, I didn't realize they would wait about 5 or so minutes between each category of time and I didn't actually get to start until almost 9 a.m., which was frustrating because it was very cold out and I could hardly feel my legs by the time we got to start. I still feel I'm not even close to ready for the Tough Mudder 12 Mile race in November. I decided to step things up a bit and signed up for a 10K trail run in Wolf's Pond Park, Staten Island, NY this coming Saturday, October 9th to see how I fair with a 10K, which is only half of the Tough Mudder race. If I can't handle that then I might be up for a very upleasant exprience come mid november.